You guys! Seriously, thankyou so much for all your positive comments! It’s so lovely to hear that you agreed with my (unexpected!) frock-choice, and it’s so nice to be able to share such an important day with everyone. Lots more photos to come if you don’t mind being mass-spammed with wedding posts for a few more days! I am so, SO blessed with my friends. I had four bridesmaids, and spending the morning with them in the luxurious surrounds of Terrara’s Bridal Salon was one of my favourite parts of the day. Months earlier when we’d been trying to make a decision about bridesmaid dresses, I was contacted by the (sublime!) Louise from Sohomode from whom I’d bought my favourite “Harvest” tea dress the year previously. It made a difficult decision incredibly easy, especially after I got a resounding “yes!” from each of my bridesmaids-to-be. 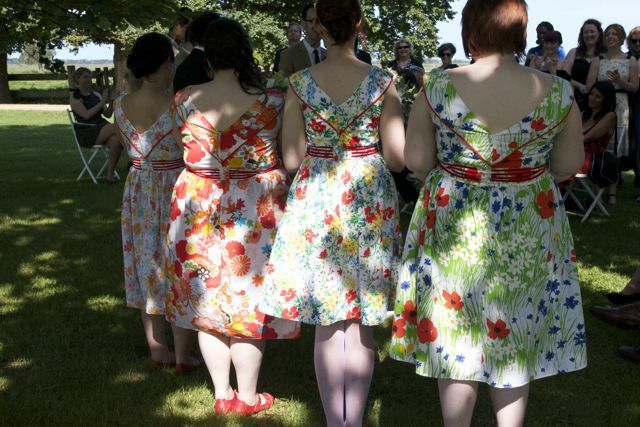 Louise’s dresses had been at the top of my bridesmaid wish-list, and the cotton sundresses – each made from their own distinctive vintage floral fabric – would suit the country-garden feel of the day perfectly. My younger sister Mae snapped up the Asian-inspired print as soon as she saw it. It provided a nice nod to our shared Chinese heritage, and the bright reds suited her colouring perfectly. Bella looked picture-perfect in the bright daisy print, and she proved her stylish credentials by teaming it with fantastic blue accessories; a bold floral ring and navy nails. I had a personal soft spot for Callie’s poppy print – the red poppies made me think of the fabulous field of poppies outside the Emerald City in the Wizard of Oz. The greens in this dress made Callie’s beautiful eyes POP! 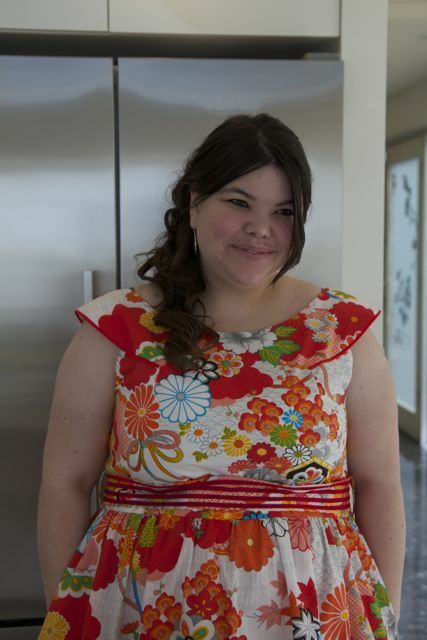 My darling, wonderful, maid-of-honour Fiona had the sweet pastel print, which was made of the softest cotton. The pale pinks and blues matched her Mary Blair tattoos so perfectly that several people have asked me whether she’d had them drawn on especially for the day. Louise cut Fiona’s dress a little differently with a higher waistband and a bit more fabric at the front to make sure she had enough room for her growing baby. 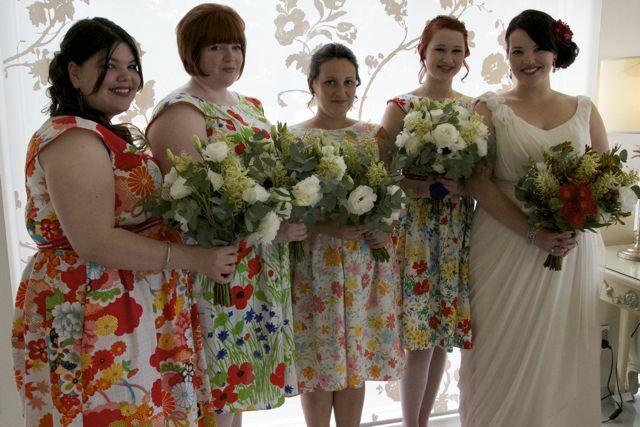 The bridesmaids wore red shoes of their own choice, and carried bouquets of white grevillea and lisianthus. I’m so thankful to Louise for making it possible to have my bridesmaids in her beautiful dresses, and I hope my girls loved them and will wear them again and again. 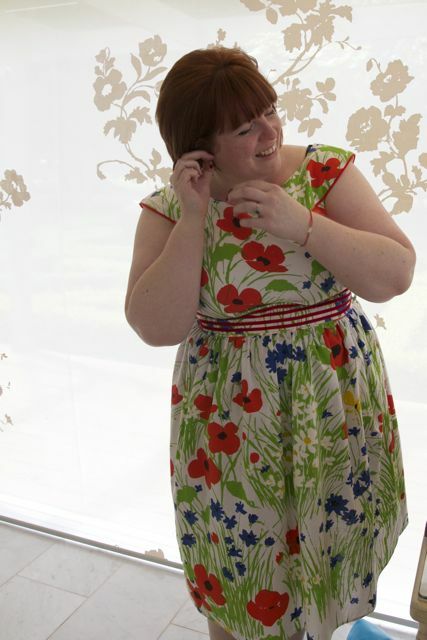 This entry was posted in How I Got Hitched, Uncategorized and tagged dress, etsy, hot, sohomode by lillipilli. Bookmark the permalink. wow, I thought your dress was amazing, these just compliment it beautifully! And they seem individually chosen for each girl, all looking fresh and vibrant. What a great choice, and I too hope they wear them for years to come! Absolutely stunning! 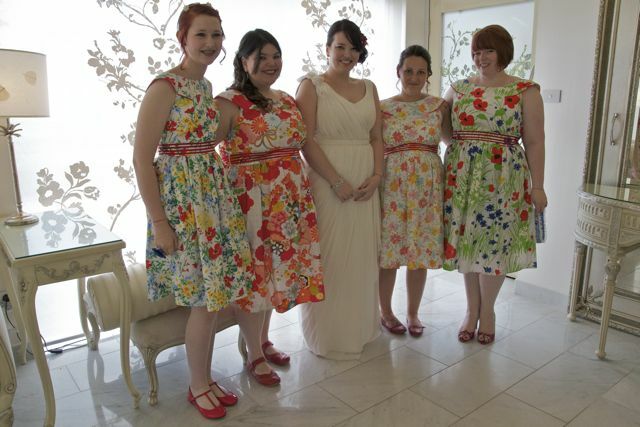 I did contemplate my bridesmaids wearing different dresses but my mum said no one would know they were bridesmaids then! I loved the dresses my ones wore but your girls look so fabulous and distinctive how could you mistake them for anything less!! WOW!!! That is all I can say. You and your girls look absolutely WOW!! Love your dress and especially the shoes and the floral dresses are stunning. Completely different, completely individual and completely WOW!!! Oh my! They are just so lovely — and I am all misty-eyed looking at how beautiful your day is. I just loved getting married… I want to get re-married to my hubs again RIGHT NOW just looking at your photos… you are making me all mushy… your friends have the most gorgeous dresses to wear again that will remind them of your lovely day. You are the best bride ever! never seen such beautiful collection of bridesmaid dresses. I love all the detailing. The dresses are so perfect! I am definitely a fan of bridesmaid dresses that can be worn again for non-wedding purposes. My favorite is the poppies, though all the girls look gorgeous in their chosen patterns. The plunged backs are my very favorite detail. Beautiful!! And they really ARE dresses they can wear again. So nice! I’ve said it before & I’ll say it again: Louise always produces amazing clothing. 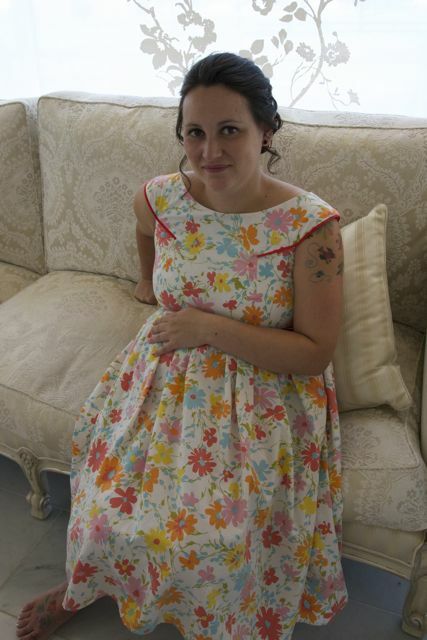 And you were right about the maternity dress she made – it is fab & fits wonderfully. If I was still pregnant (baby made an early appearance just before your big day!) I wouldn’t think twice about getting one! Lilli, I think you made the perfect choice of bridesmaid dresses. Your girls look fantastic, the dresses are perfect for the venue with the venue & what better dress than one that can be worn & loved again & again. How beautiful! I love all of the dresses! Lovely! Just lovely!! The dresses look perfect! And love the red shoes! I so want a sohomode dress!! They are the prettiest bridesmaids dresses I’ve ever seen! Spam away!! The more pics the better! What a joyful riot of ! Everyone looks sooooooo happy! I don’t think I’m expressing myself properly…I’ve just seen so many weddings that look like a rigid production where everyone has to match..often they look a bit I dunno, stuffy? (granted I’m a Melbournian living in Sydney!). The girls just look beautiful and relaxed and tickled pink to be part of your day! SOOOO beautiful…as I knew it would be. Congratulations! Beautiful! Simply stunning! 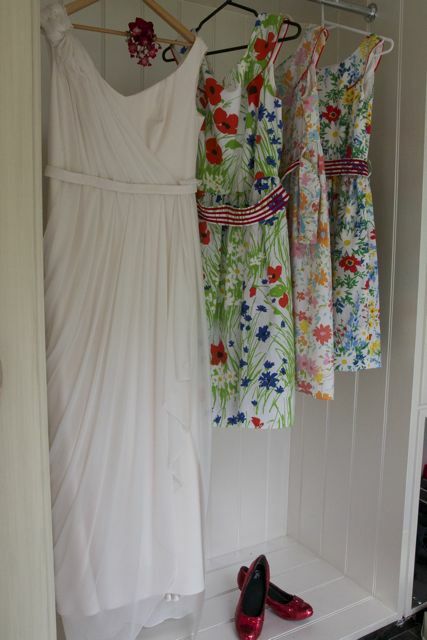 I think your choice of bridesmaid dresses are just perfect and so summery. And since I haven’t commented on your dress, it is divine, you made a great choice. Your sister looks so much like you (derr, she’s your sister!) – you guys have the same smiles. Yes please, would LOVE to see more wedding pics, so please spam us endlessly! I love Sohomode dresses – and these ones are gorgeous. So bright and cheerful, they made me smile. I’m going to be a huge sycophant here; I’ve been reading your blog for about a year & you always look superb & I love your quirky details (& I credit you for making me realise that my huge thighs are not a fault but just… thighs – I actually bought skinny jeans the other day) but, from the photos so far, I think you have exceeded all expectations with your wedding. I think it may be the most beautiful wedding I have ever seen &, whilst I don’t know you, I suspect it reflects your personality exactly which makes it the perfect wedding. I’ve been following your blog for quite some time and I so far I never posted a comment….but I absolutely have to say that you and all the bridemaid’s look picture-perfect! The flower prints worked so great with the garden atmosphere and your dress was stunning,not to mention the accesories which were just perfect! I like the cheerful bridesmaid dresses but Your dress is Stunning! Absolute Goddess! Love it Love it! I’m glad you had a beautiful wedding day. Congratulations. The girls look lovely, just so lovely! And for the record, MORE wedding spam! You all look absolutely stunning! So relaxed and happy – it reminded me of our wedding day in November. Hope you have an amazing life together. fab fab fab. The pics from your wedding are among the first to make me reconsider the wisdom of one of my mantras ‘if i ever get married I don’t want a wedding’. 😀 Congrats again! Great choice of dresses for your bridesmaids! They look wonderful and I love how each had a different print dress. So adorable! Those are just wonderful. I love the similar pattern, similar color type, different in reality idea. Lilli, congratulations on the nuptials. I LOVE all the dresses!!! I was thinking of having print bridesmaids dresses for my wedding, and you have totally helped me make the decision that yes I will be having printed bridesmaids dresses!!! And I love the way the different prints look together. And your dress is gorgeous! You’ve totally inspired me. really have enjoyed your blog and love seeing you look so pretty and chic!! LOVED your wedding dress ,shoes bridesmaids dresses, whole wedding! best wishes to both of you! What beautiful, beautiful girls! And such lovely dresses, congratulations. I just randomly came across the picture of Mae and was just so touched by the sweet expression on her face. Just had to comment!